They focused on only one thing: getting away. The two young men had just finished high school, and were about to be drafted into an army that would deny their need to worship God. Simon Ivascu and Wesley Pop were conscientious Christians, and they prized freedom of worship. If they simply refused to join the army, they could face long years in prison. The first step of their quest for freedom took them from their native Romania to Italy. It was a journey fraught with danger. After reaching Italy, one night they crawled into a container full of ceramic tiles that was headed across the ocean. The young men had heard about Canada and the freedom it offered. But it was a long nightmare away. They baked in the heat for days while they waited in the shipyard, hiding in the container. Once underway, they experienced a wild storm at sea, suffered from lack of oxygen, and experienced extreme hunger and thirst. Both came close to death. At last they arrived in Canada. It’s another story how they regained health and travelled from the status of illegal aliens to honorable citizens of their adopted country. Their harrowing story is chronicled in their book, The Price of Freedom . The book is described as a tale of “adventure, courage, mistakes and miracles.” It takes the young men through long nights as fearful fugitives to protracted days “as ‘cargo’ on the high seas — from police prisons to container prisons” — and eventually to something more than political freedom. The pair arrived in Kelowna in July, 1999. In the decade since, they have made a remarkable life and ministry. From hiding in a container full of ceramic tiles, they have found careers in the construction industry as ceramic tile layers. Beyond that, they have created a musical ministry, that allows them to tell their story in a way that is dear to their hearts. Simon and Wesley had always loved to sing, and were soon blending their voices in duets in many local churches. A year later, they were joined by Simon’s brother, Steven Ivascu, who managed to get from Romania to Canada on a work visa; and by Donovan Diminyatz, also from Romania, who is now a university student in Kelowna. The four young men called their vocal group Freedom Singers — a particularly apt name, considering the background from which they have triumphantly emerged. The group has been touring western Canada, bringing their music and stories to churches, rallies and camp meetings. As well, they have taken on two humanitarian projects. One is called Global Care-A-Thon Mission, which works with children in India, Romania, South Africa and Mozambique. It sponsors fundraiser walks, and features the Freedom Singers — most recently at a walk-a-thon in Beaumont, Alberta. The other is Project Family Room — often called Kelowna’s own extreme home makeover. Last year, Paul Benson of Borebank Ventures was asked by Bob and Crystal Mandryk to look at building an addition to their 1,000-square-foot home. The Mandryk family was bursting the seams of the tiny house. Their family of nine children includes five adoptees; some of the children have special needs. Benson rallied the construction community, asking for donations of time and material to build the family a new home. The family moved in just before Christmas. The Freedom Singers got involved by singing at events to raise awareness and funds for the project. They have characterized it as a way they can put their faith into action. 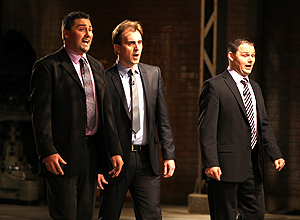 Update: Simon and Wesley and the Freedom Singers appeared on CBC’s Dragons Den on November 2011. See their pitch here.